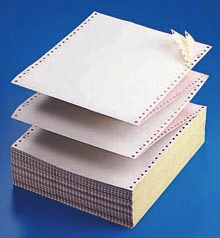 A dot-matrix printer is named after the pattern (a grid or ‘matrix’) of dots used when creating the paper printout. These dots are formed by tiny pins in the printer’s print head that hit an inked ribbon against the paper leaving marks. As the print head moves along it leaves a pattern of dots behind it which can form letters, images, etc. 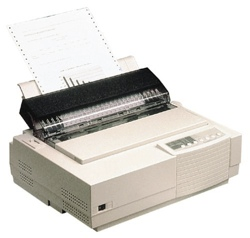 Dot matrix printers often use continuous stationary: long, continuous strips of paper (rather than separate sheets of A4 like ink-jet and laser printers use). After printing, the printout is torn off from the long strip. The print mechanism is very cheap, and the inked ribbons last for along time. 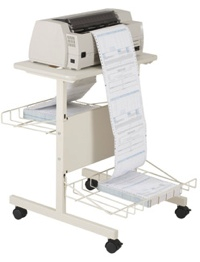 So, where cheap, low-quality printouts are required, dot-matrix printers are used. An example is shop receipts. 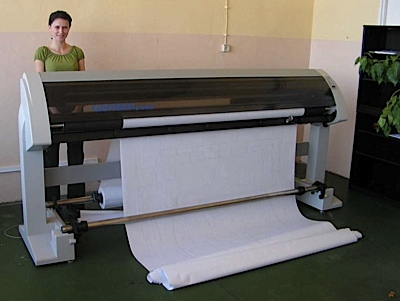 Cheap, high-quality, full-colour printing became available during the 1980s due to the development of ink-jet printers. These printers have a similar print-head mechanism to a dot-matrix printer. The print-head passes left and right across the paper. However, instead of using pins to hit inky marks onto the paper, the ink-jet squirts tiny dropletsof ink onto the surface of the paper. Several coloured inks can be used to produce full-colour printouts. The droplets of ink come from tiny holes (the jets) which are less than the width of a human hair in size. Each droplet creates a tiny dot on the paper. Since the dots are so small, the quality of the printout is excellent (1200 dots-per-inch are possible). This is perfect for photographs. Ink-jet printers are very quiet in use. Since they have so few moving parts they are also cheap to manufacture and thus cheap to purchase. However, the ink is very expensive to buy (this is how the printer companies make their profits!) so the printers are expensive to use. 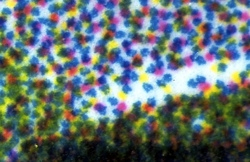 This is a close-up of the tiny ink dots on a page. The dots combine to form light and dark areas. 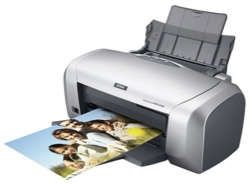 Laser printers are very complex devices, and thus expensive to buy. However they are very cheap to use. This is because they produce marks on paper using a fine dust called toner which is relatively cheap to buy. A single toner cartridge will often last for 5,000-10,000 pages of printing. 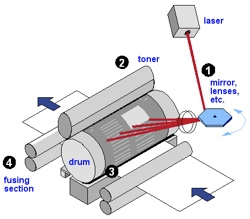 The laser and toner system allows very fast printing compared to other printers (just a few seconds per page). 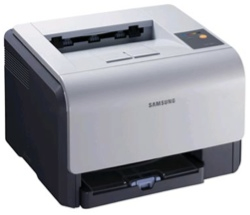 Laser printers are very common in offices since they print very quickly, are cheap to use and are reasonably quiet. 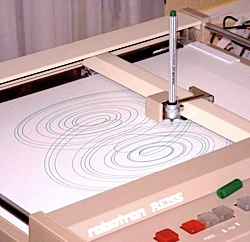 Plotters create hard-copy in a very different way to printers. Instead of building up text and images from tiny dots, plotters draw on the paper using a pen. The pens are held in an arm which can lift the pen up or down, and which can move across the paper. The arm and pen create a drawing just like a human could, but much more accurately and more quickly. Different coloured pens can be used to produce coloured line drawings.